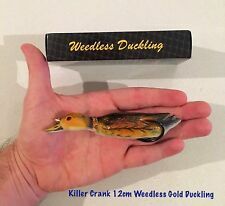 12cm Weedless Surface Duckling Lure . ::killer Crank : Size : 12cm. Killer Crank Lures. 1 x Lure . Topwater Fishing Lures. Fishing Swimbaits. Soft Plastic Fishing Lures. Smithwick Devils Horse 3/8 oz Surface Lure. Hunting & Tactical. Lure Weight: 3/8oz; Lure Length: 4.5". Use 6-20lb test fishing line depending on lure weight and rod action. Cranking Depth: Topwater/Surface Lure. Storm Arashi Top Walker Color: Ghost Pearl Shad Size 13 Swimming Depth: Topwater Length of Body: 5-1/8" Weighs 1-1/8 oz. Hook Size: 2. Color: #01 Tonosama. Type: Floating. Length: 56mm (2 1/4in). Storm Arashi Top Walker Color: Wakasagi Size 11 Swimming Depth: Topwater Length of Body: 4-1/4" Weighs 3/4 oz. Hook Size: 4. Savage Gear 3D Bat Lure Color: Gray Size: 4 Weight: 1 oz Floating. Hunting & Tactical. Species: Largemouth Bass, Smallmouth Bass, Northern Pike. Lure Length: 2". Survival & Safety Gear. Safety & Reflective Gear. Kid's Clothing & Shoes. Hooks: #4 Treble Hooks. Cranking Depth: Topwater. Storm Arashi Top Walker Color: Bluegill Size 11 Swimming Depth: Topwater Length of Body: 4-1/4" Weighs 3/4 oz. Hook Size: 4. Storm Arashi Top Walker Color: Green Gold Shad Size 13 Swimming Depth: Topwater Length of Body: 5-1/8" Weighs 1-1/8 oz. Hook Size: 2. Savage Gear 3D Hollow Belly Duckling Lure Color: Yellow Chick Size: 3" Weight: 3/4 oz Floating. 2 Jackall Green Frog Pompadour Jr 2.6" Hard Topwater. or slow retrieve. Jackall Pompadour Jr. lures include a rear prop to create splash and. ultra-noisy topwater lure designed to call up fish. These lures feature a magnetic center of. Because of its aerodynamic design, it's the master distance caster and catches fish from pan-sized trout to bragging-sized stripers - in fresh and salt water. Resistance Training. Imagine stopping your buzzbait right next to that stump and letting it float there, then twitching and shaking it to entice a big bass to strike. Or, throwing a buzzbait on top of the slop or over wood cover and working it out with no snags?. Bionic silicone skin soft frog lure With Legs. Made of super soft and elastic material，super-strong and super-sharp hooks. Super durable hooks are positioned perfectly to be 100% weedless, allows it to be worked over weed choked areas or lily pads without Snagging up. SAMMY makes it easy. Combine its easy to achieve "Walk the Dog" action with the spitting action of a popper and SAMMY gives you unsurpassed top water performance. But that's not all. Class : Floating. Strike King Swinging Sugar Buzz topwater lure. Two (2) Savage 4” Hybrid Shrimp in Nuclear Chicken color pattern. These slow Sinking models can be fished as a Jerkbait or on the surface when fish are aggressive. Savage Gear 3D Rad Rat Lure Color: Firetiger Size: 7 3/4" Weight: 1 oz Floating. 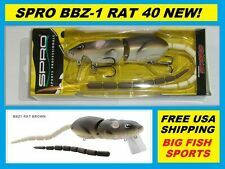 Savage Gear 3D Rad Rat Lure Color: Red Brown Size: 7 3/4" Weight: 1 oz Floating. Rapala Skitter Walk Color: Baby Bass Size: 08 Swimming Depth: Topwater Body Length: 3 1/8" Two No. 3 Treble Hooks. 6cm Surface Duckling . ::killer Crank : Killer Crank Lures. 1 x Lure . Size : 6cm. Topwater Fishing Lures. Fishing Swimbaits. Soft Plastic Fishing Lures. Rapala Skitter Walk Color: Holographic Orange Gold Size 08 Swimming Depth: Topwater Length of Body: 3-1/8" Weighs 7/16 oz. Two No. 3 Treble Hooks. Savage Gear 3D Rad Rat Lure Color: Red Brown Size: 11 3/4" Weight: 2 1/2 oz Floating.